The weather has been dreary with this tropical storm looming about. It's been a VERY wet spring. 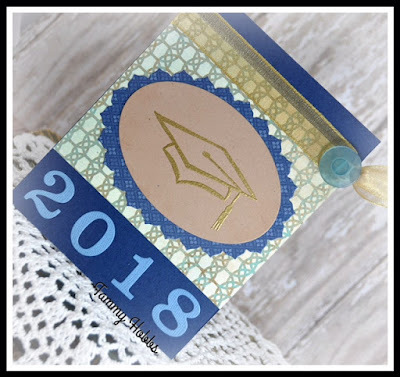 I started by embossing the Graduation Cap (DeNami Designs) with gold embossing powder to create my focal point. I had a piece of patterned paper from a recent card I made still on my desk. I liked how it looked against the navy card stock, so that was an easy design find at my finger tips. I adhered it to the front of the card leaving enough room to add the die-cut numbers (My Creative Time) for the year to add to the bottom of the card. I have this huge roll of Gold ribbon from May Arts that I have had for at least 10 years. Good thing that gold never goes out of style! 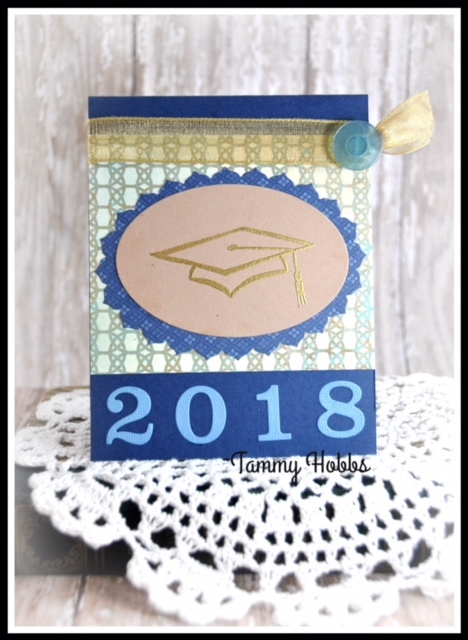 :))) I took a length and wrapped it around the card front and instead of tying in a bow, I secured it with a blue button from my stash to complete this graduation card! Gorgeous! LOVING the colors and the cap!!!!!!!!!!!! Beautiful card!!! I guess that means you'll have lots of flowers to look forward too with all that rain you're having!!! LOL Have a great weekend!! Very nicely crafted! Thanks so much for sharing with us at Shopping Our Stash! Great Graduation card! The gold ribbon coordinates perfectly with the embossed image and I really like the button to finish it off! Thanks for playing with Jo's Scrap Shack. Fantastic graduation design! The gold embossing and ribbon are super eye catching. Love your button tie, too! Perfect for the graduate. Thank you for joining our “Anything Goes” Challenge at Die Cuttin’ Divas.